It has been blowy, chilly, snowy, freezing, wet, and downright cold during our calving season. In other words, typical weather for calving. Our AI heifers are nearly calved out and it will be a relief when the last calf hits the ground. We have brought many of the heifers into the barn this year to calve. A few panels, some straw and voila! A handful of pens which we have dubbed The Maternity Ward. The calves do much better when they are warm and dry. It doesn’t take them long to get up and walk around and start looking for their mama’s milk. 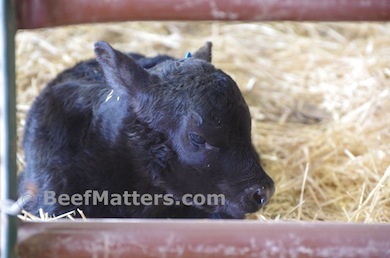 This little calf was several hours old and doing great. 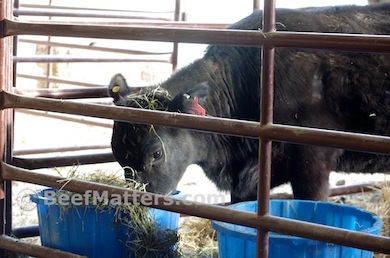 Re-purposing a few old lick tubs is an easy way to provide hay and water to the heifers. Calving season is always stressful for the cowboys and the cattle. It is also one of the most rewarding times on the ranch. Watching a heifer lick her newborn calf and soon after seeing that calf standing to nurse his mama is one of my favorite parts of the job. After a few hours, the new mama and her calf are turned out into the field with the rest of the heifers who have calved. 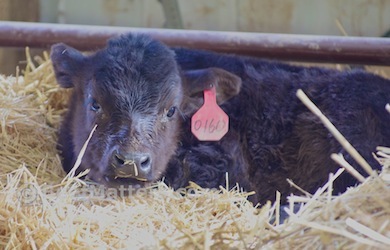 In no time at all, this little guy will be romping across the field with the other calves.